With softball season looming, Miss Y decided that we should have a practice session. Sounded like a good idea to me, especially since I got a new glove that needed to be worked in. You see, I play first base and Silent Bob plays short. His throws the balls so hard, I don't need to "catch" it because the ball becomes permanently embedded into my glove. Therefore, I had no choice but to purchase an actual first baseman's glove to protect my picture-taking hand. Hey, that is important! So we were all ready to go for a Monday evening practice when good ol' rain got in the way. What to do now? Seeing how we already had set aside time, the only logical thing to do was go eat! One problem though. We met up at the field at 4:00pm. That's too early to eat... or was it... So it was decided that we'd go for a pre-dinner at Wings first! Wow, the team not only eats with me all the time, they are taking it seriously! After some wings and appies, we were originally set on Makoto. Another problem. They were closed. So we ended up at Tomoya instead. I've been here countless times; but I didn't mind, my pictures were crap and needed updating anyways. Judes, Milhouse, Emilicious and I decided to share while Miss Y and Bear did their best Dr. 911 impression (which is to not share!). 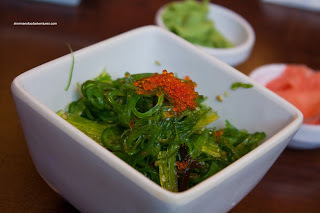 For those sharing, we started with a Wakame Salad. Topped with tobiko, the wakame had the desired crunch while the dressing wasn't short on flavour. They weren't shy with the rice wine vinegar which I personally don't mind. The toasted sesame provided some aromatics as per usual. While we were looking at the menu, a section caught our attention. Labeled as "Tapers", I'm sure they mean tapas. Don't people ever get someone to proof-read??? Tapers? Honestly. So... in the tapers section of the menu, we selected the Grilled Asparagus. Topped by what seemed like a wasabi mayo, this was alright. 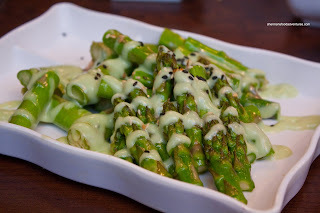 I mean the asparagus itself was grilled perfectly. It was cooked all the way through while still maintaining a bite. However, the sauce was far too mild to make any impact. We also got a bunch of specialty rolls starting with the daily special which was the Flamingo. 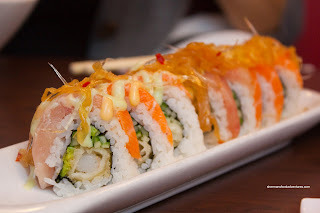 The inside consisted of salmon, spicy tuna, avocado and cucumber with hamachi on the outside. 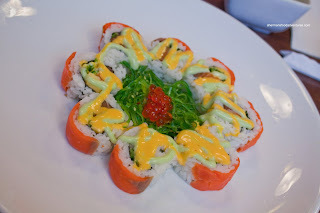 The entire roll was drizzled with wasabi mayo and mango sauce. In our opinion, this roll was not worth the regular price, which was around $13.00. The components were fine; but nothing set it apart. The rice was pretty average. It was slightly dry and mealy. Looking past that, it was a decent roll though, if not a bit on the sweeter side. Next up was the Phoenix Roll consisting of what is essentially a dynamite roll in the middle (ebi tempura, cucumber and avocado) with salmon, tuna, fukahire kurage and the same house sauces found on the previous items. This was a substantial roll that seemed to be a better value than the Flamingo. Ultimately, this was a pretty decent roll mostly due to the tasty and texturally appealing fukahire kurage topping. Lastly, we got the Blossom Roll consisting of salmon, cucumber and tamago on the inside with smoked salmon on the outside. Wakame salad and ikura with the same house sauces finished the plate. The roll itself was not bad considering the ingredients were fresh; but the use of the same sauces made the flavours repetitive and boring. At least the wakame gave some variation in texture and taste though. From my previous visits here, it is clear that one of their signature items is the Black Sun. 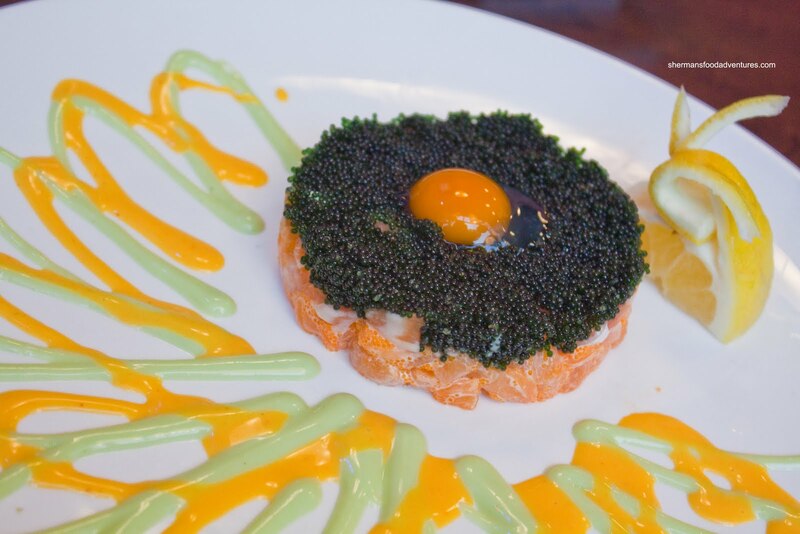 What is essentially a form of salmon yukke with black tobiko, this again was marred by the use of the same house sauces. Now if we ignored the sauces and merely ate the salmon mixed with the tobiko, it was mild and slightly sweet. The lemon wedge was a necessity as it helped liven up the flavours a bit. In the end, this would've been better if it was served like salmon yukke which usually is accompanied by an eating vessel (ie. nori, shrimp chips). Bear didn't want any rolls and instead went for the Chicken Yakisoba. Being Japanese, he was resigned to dining on mediocre food since Tomoya is not Japanese-run. And honestly, the yakisoba was exactly that. It was neither poor or good. 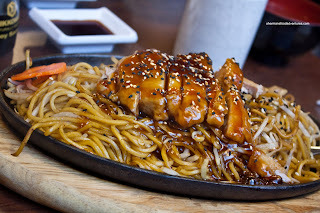 It was your typical stir-fried noodles with slightly dry chicken on top doused by a sweet teriyaki glaze. Miss Y also did her own thing with the Tempura Don. By just looking at it, I thought to myself that it looked kinda dry. Yah, the rice was dry and it didn't help that they only provided a modest amount of tempura dip. She was expecting the rice to already be pre-sauced; but it wasn't. Thus, it wasn't really an enjoyable don for her. 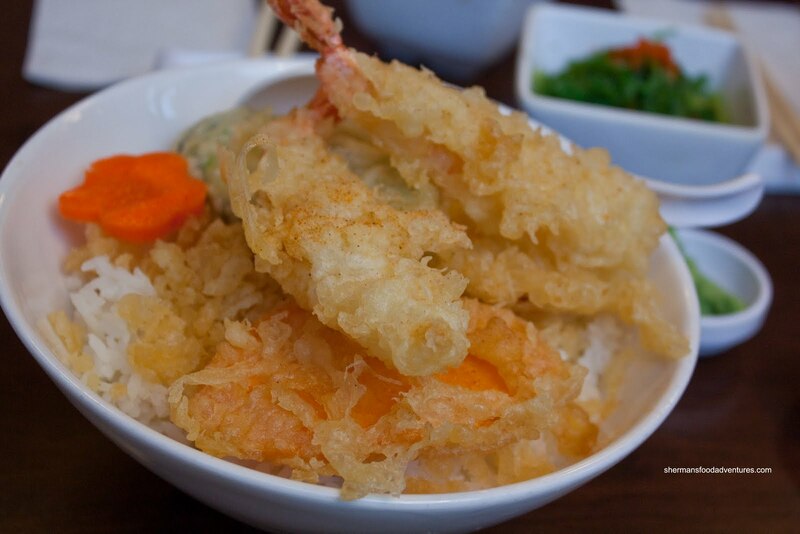 Furthermore, the tempura batter was too thick. So, much like the previous times I've been here, the cooked food is something that is only passable. The consensus at the table was one of indifference. Therefore, this revisit was only so-so. Did their standards go downhill? Have my sushi tastes been refined? A little of both? 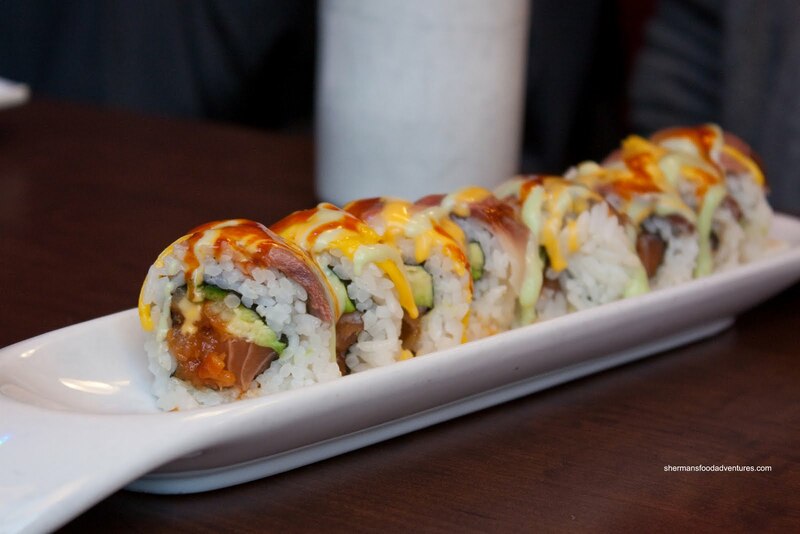 Whatever the case, the main thing going for Tomoya is their good selection of well-priced specialty rolls. - Menu has a little of everything including "tapers"
Their flying dragon was a favorite of my family. We use to go there at least twice a month, but after the last few times of crappy food and spotty service, we have since moved onto Sushi Garden. We miss the specialty rolls, but at least Sushi Garden is inexpensive. I went there awhile ago. It has AMAZING beef sashimi. It's different from most other japanese restaurant varieties. It's like well marbled, chewy and fresh... a very good surprise. I can't find anything quite like it anywhere else. I highly recommend it if you ever visit again! Yah, the food here at Tomoya is not that carefully made nor is it "gourmet". But then again, it fits the bill for the price.